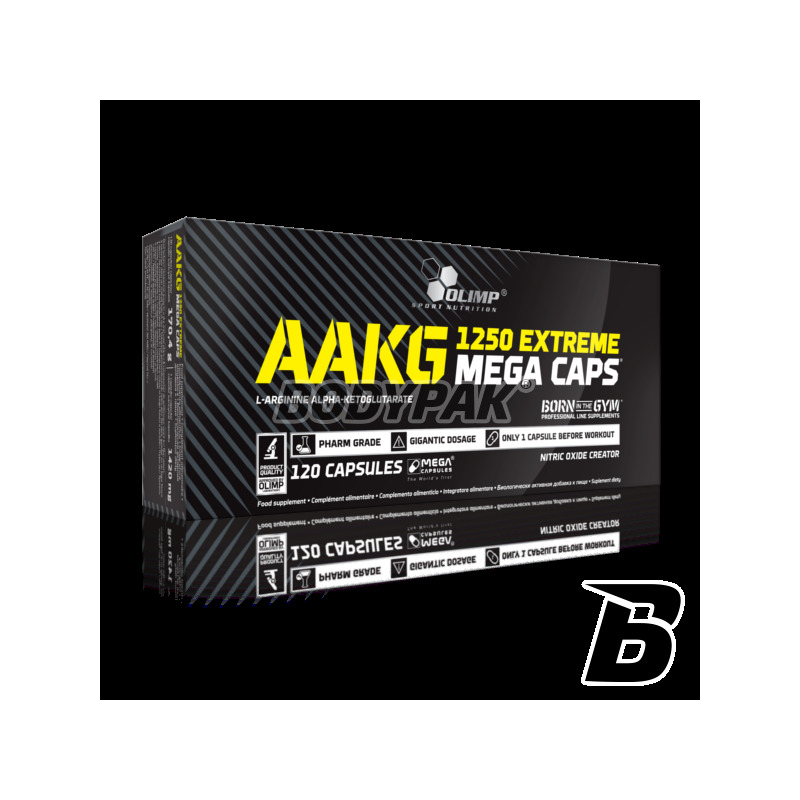 Amino AcidsOlimp AAKG 1250 Extreme Mega Caps - 120 kaps. Perfect for stimulation of strength, mass and pumps as well as a "super booster" when combined with other supplements: creatine, HMB. Bet on a proven way to improve your performance! 1250 MG ARGININE ALPHA KETOGLUTARATE THE KAPS 1. Olympus AAKG 1250 Extreme Mega CAPS® - For the first time on the market, the highest quality AAKG in dizzyingly high, unprecedented dose of 1250 mg in one capsule. MEGA CAPS! 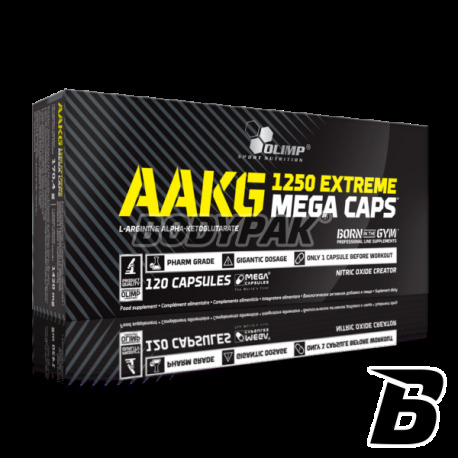 Olympus AAKG 1250 Extreme Mega CAPS® in the form of an easily absorbed arginine alpha ketoglutarate (AAKG) supplements your diet with L-arginine. Arginine is a nutritional element, which formed in the body active biological compounds, important for body shaping, developing functional capacity and preserving sexual performance - agmatine and nitric oxide (NO). Arginine enables adequate blood, oxygen and nutrients to muscle tissue, facilitating muscle growth, adipose tissue reduction and erection. This product is intended for recreational athletes, professional athletes. With the exercise - 1 capsule before and after training and before going to bed; for those seeking to maintain sexual performance - 1-2 capsules once for approx. 30 min. before anticipated sexual rapprochement. Składniki: alfaketoglutaran argininy (AAKG), celuloza mikrokrystaliczna - substancja wypełniająca, stearynian magnezu – substancja przeciwzbrylająca, żelatyna - otoczka kapsułki. przyjemny bodziec do treningu , mięśnie silnie pobudzone bardzo dobra aktywność polecam firmę olimp ! Bardzo fajna pompa na treningu! Rewelacja! Mięśnie aż pękają! polecam kazdemu sprobowac niesamowite uczucie! Skondensowana dawka AAKG, pompa mięśniowa niesamowita na treningu.